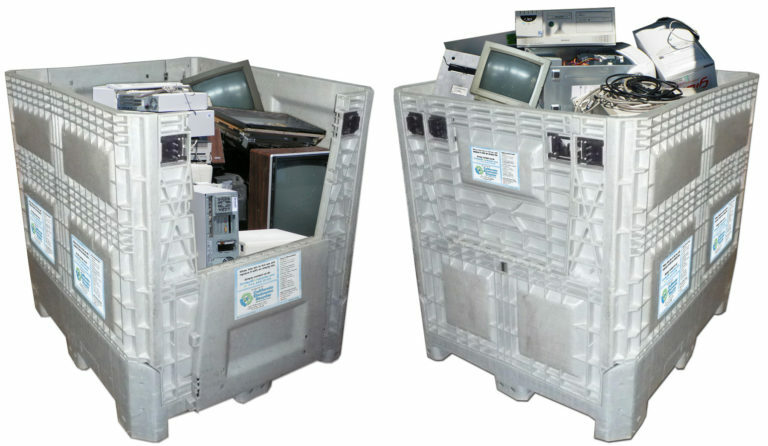 In order to facilitate the collection of your electronics waste, we offer an On-Site Collection Bin Program. We deliver the bin, you fill it, and we’ll take it from there! Contact us today to have an empty bin delivered right to your door. We will deliver one or more of our bins to your business. Once the bins are full, call or email us to order a pickup. We will pickup the full bins and replace them with empty bins. Data destruction is ensured through a reputable company. We pickup the bins at your convenience. The bins provide a clear, convenient, and consistent storage location. You can avoid the liability of fines and hazards arising from improper storage or breakage. The bins allow easy loading through the front access door. The bins clearly detail which items require recycling.